SQL Server is software, developed by Microsoft for large-scale online transaction processing (OLTP), data warehousing, and e-commerce applications. Sql server is platform dependent and it is both GUI and command based software. It is also a business intelligence platform for data integration, analysis, and reporting solutions. Why we use SQL Server? For the purpose to create and maintain databases. You can use Sql to analyse the data through SQL Server Analysis Services. The diagram shows the relationships among SQL Server 2005 components and identifies interoperability between components. 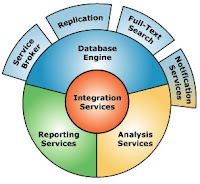 Database Engine: - It is the core service to storing, processing, and securing data. Reporting Services (SSRS): - It is a server-based reporting platform that provides comprehensive data reporting from relational and multidimensional data sources. Replication: - Replication is a set of technologies for copying and distributing data and database objects from one database to another, and then synchronizing between databases to maintain consistency. Support multiple Editions and Price Variations.